This blueberry Bakewell tart recipe will go down a storm at any summer dinner party. 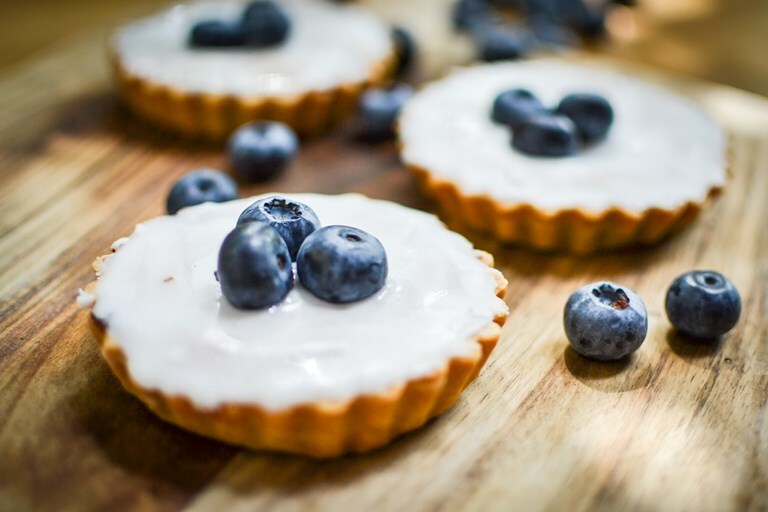 The soft frangipane centre sits atop a bed of fresh blueberries, all set in a crisp homemade pastry case. I have started running again and that means I have started to make pastry again. They are the perfect match. Making pastry is not for those in a rush. There are stages and steps and yes that can be a bit of a faff sometimes but if you tie these into a running routine then it all works out nicely. Let me explain. First you make the dough. Easy and quick when you use a food processor. Then you need to let the dough rest. It doesn’t matter how long. So you spend this time that the dough is resting running. I usually do my long run for around 2 hours but it’s entirely up to you. This part fits in with any running routine but I would suggest around 30 minutes minimum. Then when you come back your dough is ready to roll out and line your pastry cases with. After that it goes in the freezer for 15 minutes. This is when you do your squats or use your foam roller to make your legs stronger. Then you pop the tarts in to blind bake. 15 minutes. That’s your high-intensity skipping time to build up your lung capacity. Then you whip up your frangipane mixture, prep your tarts for the oven and bake. That’s your second run. The timed run because you need to be back in 30 minutes to get your tarts out of the oven or they will burn. There’s a good incentive right? And finally you take the tart out of the oven and while they are cooling in their tins you do your warm down. And when they are cooling on the wire rack you have a shower. Here’s a nice easy recipe you can try with fresh blueberries which are in season right now.